With an average year round temperature of 22C, short flights from anywhere in Europe and world-class beaches it’s not surprising that Lanzarote attracted over 3 million tourists in 2017. But does Lanzarote, the easternmost island of the Canary Islands, have more to offer visitors than just beaches? 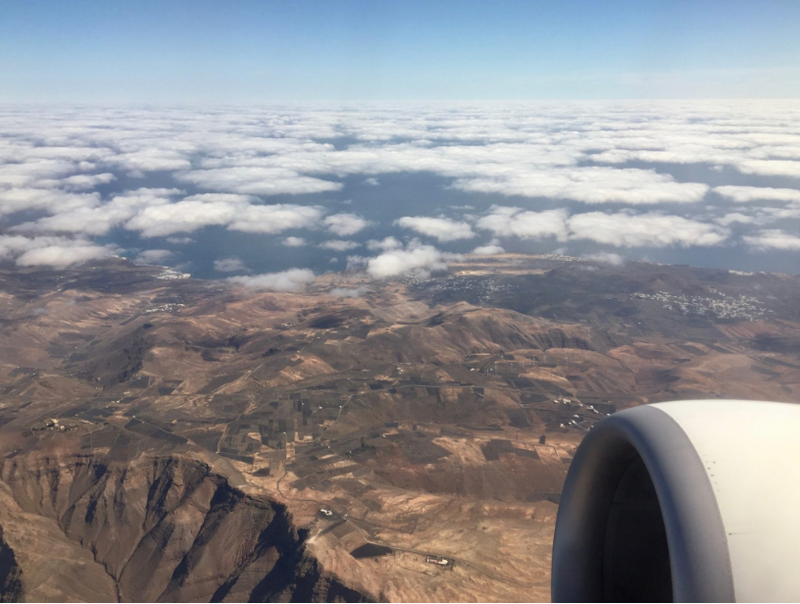 We recently flew out ourselves to investigate with Turismo Lanzarote and invited along a few family travel bloggers to join us. Between the 6 of us (Jen from Jenography, Susanna from Modern Mother, Lisa from Travel Loving Family, Carrie from Flying with a Baby, Helen from Actually Mummy and Sarah from Extraordinary Chaos) we took thousands of photos, hours of video footage and pages upon pages of notes! Below we share a round-up of our articles, videos and social media posts. We flew into Arrecife airport and headed straight to Castillo de San Jose for absolutely fabulous lunch overlooking the harbour and Atlantic and sculptures of horses created by Jason de Caires Taylor. Our dessert was calorific but incredibly tasty! Our next stop was Jardin de Cactus. Created by the islands late legendary artist and architect, César Manrique. It’s a fascinating place to explore over 4,500 specimens of cacti. We visited towards the end of the day and were treated to an amazing sunset which you can see over on Sarah’s review of the gardens. Our crazy little group checking out the prickles at the Cactus Gardens! We then checked into our rather posh hotel, Hotel Grand Teguise Playa, a 320 room hotel with stunning views over the swimming pools, Playa del Jubilo beach and the Atlantic Ocean. The lobby and premium rooms certainly had the wow factor as shown in this review post by Susanna and in the video below by Helen. 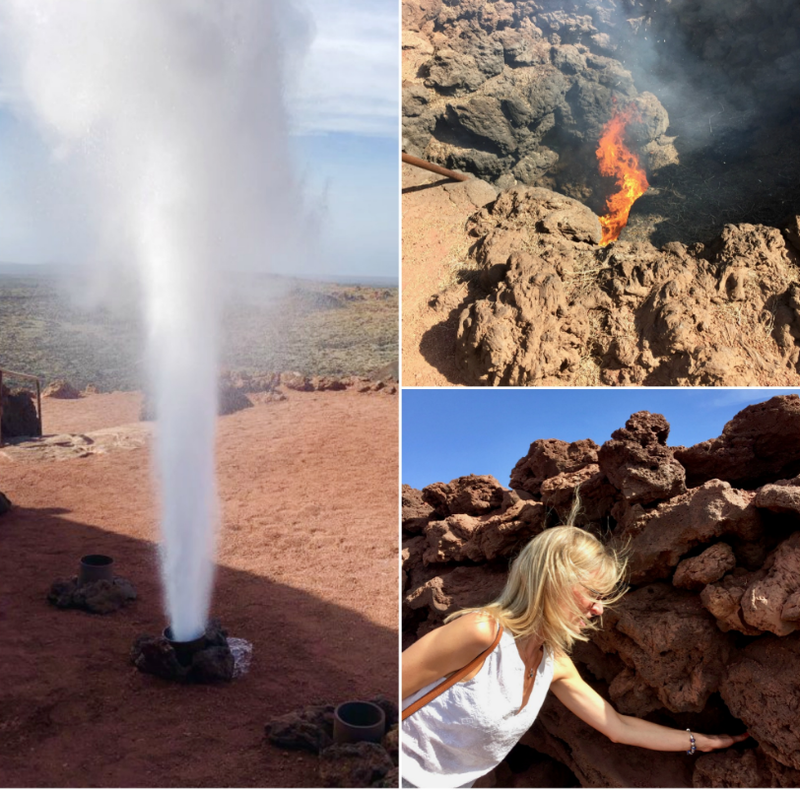 After we said goodbyes to the friendly camels we visited the Timanfaya visitor centre to watch a simulation of a volcano erupting and witness first hand the heat from the volcanic ground. The El Diablo Restaurant, was just one of the many incredible restaurants we dined at whilst visiting the island. 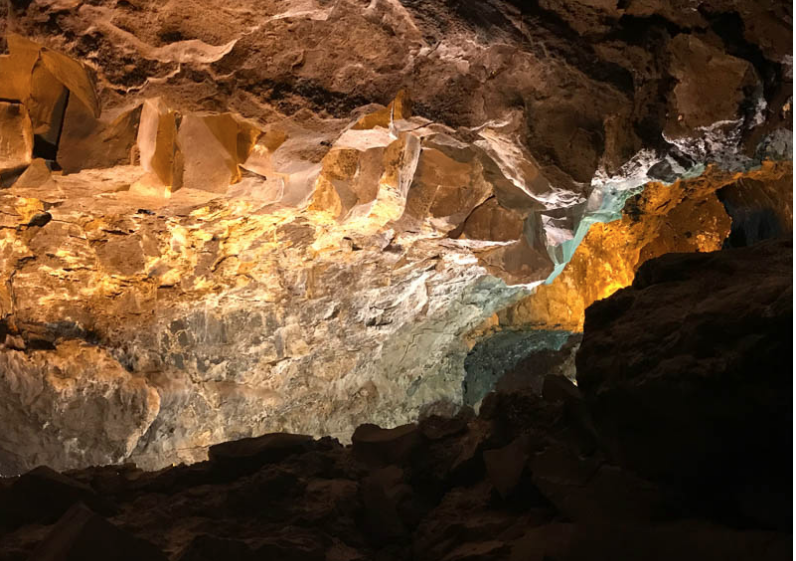 Check out this guide by Sarah for more restaurant recommendations including a restaurant in a lava tube and dining under the stars at an open air cinema – 5 Unique Restaurants, Lanzarote. Our afternoon was spent at Cueva de los Verdes exploring some of the vast networks of tunnels and caves carved through the cooling lava rock by red-hot lava streams. We found it fascinating to walk through the rabbit warren of tunnels, and caverns caused by gas bubble explosions. “The caves really are a ‘hidden wonder;’ used as a hiding place in the 17th century to avoid capture and enslavement by pirates, they now house an underground concert stage you’d never imagine was there, and more than a few surprises – I won’t say more than this as I don’t want to spoil the biggest surprise of all, but trust me, it’s worth a visit!” Helen – taken from Volcanoes in Lanzarote: Best Day Ever! After racing each other down slides and enjoying a swim we headed to Rancho Texas, a zoo and water park which puts on several shows daily featuring birds of prey, sea lions, dolphins and cockatoos. Both of these parks and all the other attractions we visited can be seen below in Lisa’s video featuring the best attractions for families in Lanzarote). It’s fair to say that our group discovered that the volcanic island of Lanzarote has so much more to offer tourists than beaches! 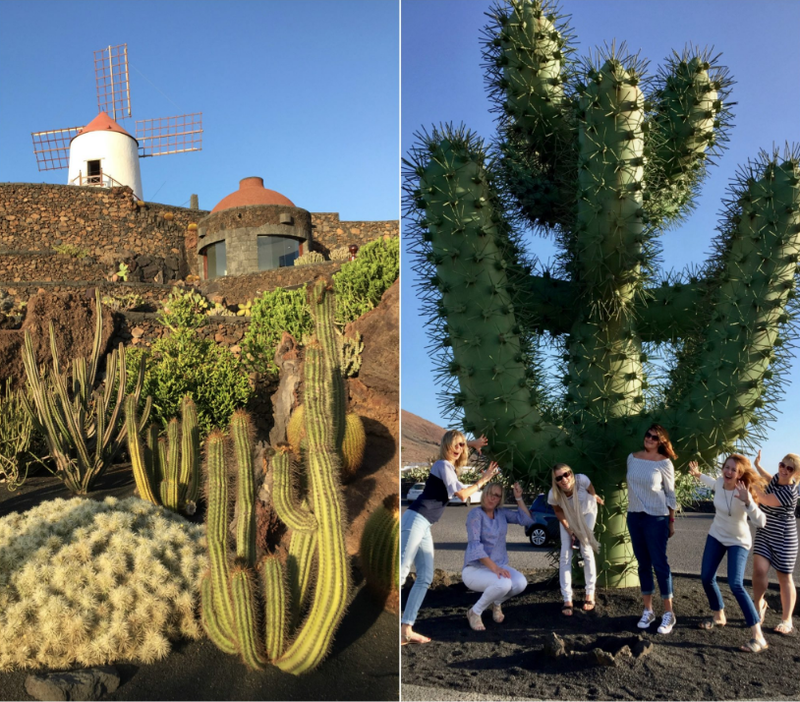 Susanna summarises the must see attractions in this helpful post – 10 things to do in Lanzarote – that’s not lazing on a beach! Jen shares her 10 favourite activities on the island and Lisa shares her recommendations in this round-up – 15 fun things to do in Lanzarote with kids. If you are looking for help in planning a trip to Lanzarote check out Carrie’s comprehensive 7 day Itinerary for a family holiday in Lanzarote and her Lanzarote Family Holiday Tips. And finally, if you’ve been to Lanzarote before and have the ‘been there, done that, got the t-shirt’ attitude you’ll change your mind when you read this post – Reacquainting myself with Lanzarote – Ten years on. Next Post Newbie Round-up: Is it summer yet? Such a wonderful trip. A friend is out there now so it has been lovely revisiting the island through her eyes too. It changed my perception of the place for sure.